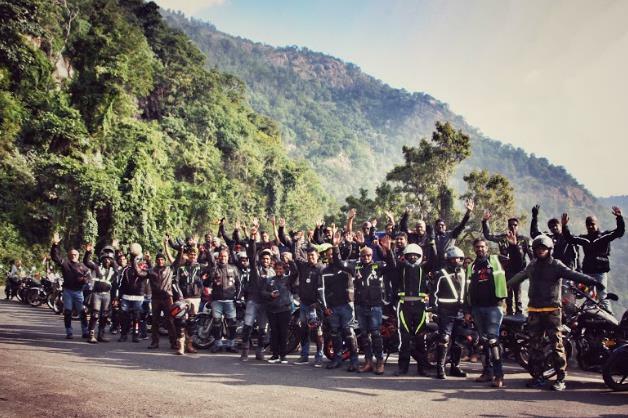 The entire clan of Road Thrill was excited when we got the event notifications of Road Thrill Bangalore’s 100th Ride to Yercaud. After Rider Mania, the next big ride of the year 2017 was the Centurion Ride. 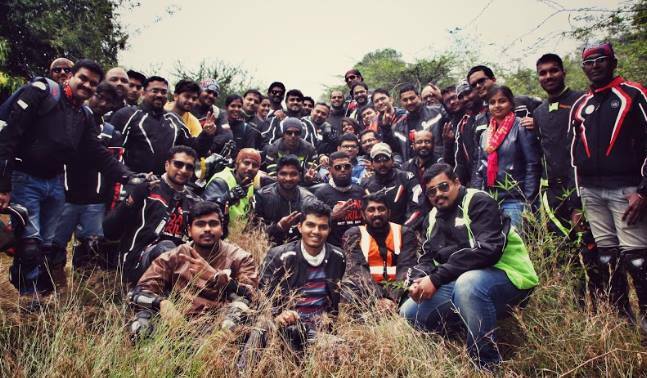 The journey of Road Thrill since its inception has grown tremendous, where the riders and all members have become One Extended Family. 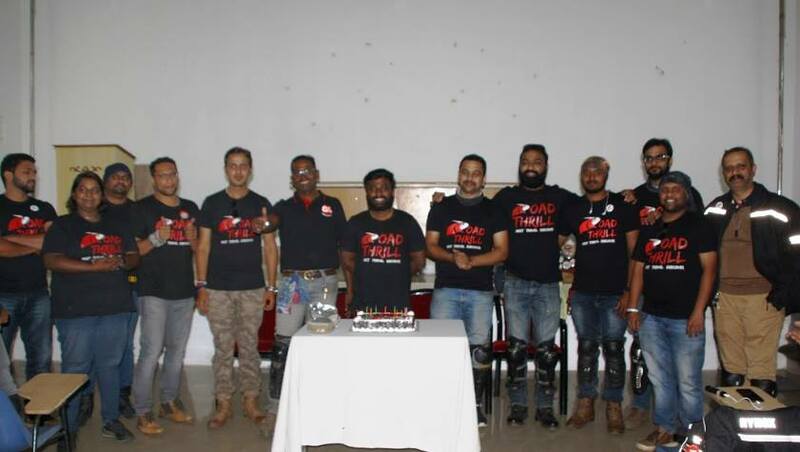 The 100th ride was a meetup with our members from our Chapters of 4 different cities; Bangalore, Chennai, Coimbatore, Shivamogga and not to forget our Women Riders from Road Thrill Women. The number 100 is always special; The Sachin’s 100, Rossi’s 100th MotoGp Win, Bollywood’s 100 Crore collection, the 100 years of Indian Cinema and so was our #RTBengaluru’s 100th Ride. 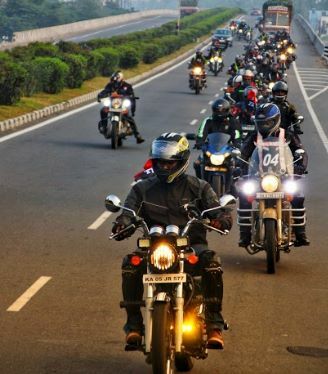 All our Riders waited excitedly to gear themselves and hit the road to glory, the feeling of being there at 99 gives you goosebumps. Two days before the ride, our members were in weekend fun mood and the #TrollsofJP started rolling in our Whatsapp groups. 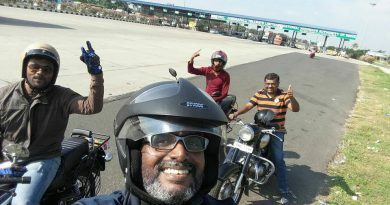 Our biker’s from Shimoga started all the way from Shimoga and reached Bangalore on Saturday night while our dear Dr. Senthil sir rode all the way from Coimbatore only to ride with us to Yercaud for the Centurion Ride. Finally, the big day arrived. Udayshankar Sir and I started from JP Nagar and Lohit Bhai joining us at BTM Petrol Pump, we reached the final meeting point after Electronic City Toll. 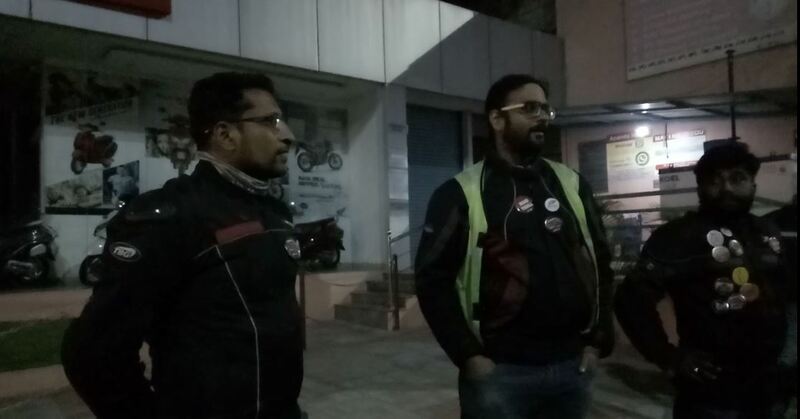 Arun Bhai briefed about the ride, the hand signals, speeds to be maintained in a group ride and the ride just began. 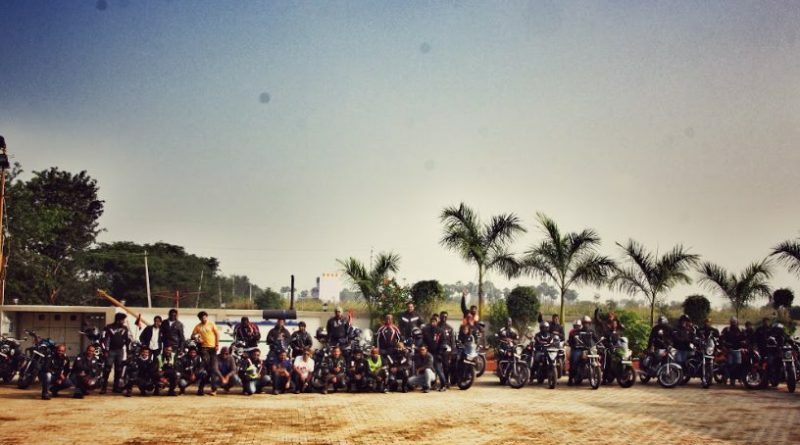 Arun Bhai, Lohith Bhai and JP lead the ride, KC bhai and Abhishek Bhai marshalled, RK Bhai and I managed the tail end. Post a chaai pit-stop at highway-side of Krishnagiri, we stopped for Breakfast at Hotel Annapurna at Dharmapuri. Few photo sessions post breakfast and yet another small briefing session by JP Bhai, the ride continued and dear Usmaan Bhai lead the ride. A few more kilometers and we took a detour from the highway and roads passed through few villages. The group traversed through a local village fair, one of our rider riding KTM sensed his bike being over-heated. Usmaan Bhai leg towed the bike for few a while. As the ride was passing through few stretches of off-roads, Arun Bhai, JP, KC Bhai and I were left behind as we were ensuring nobody missed the route. A local, helped us to navigate the route to Yercaud. 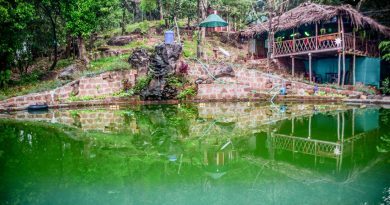 All of us paced through the off-roads and the ghat sections making our way to the Wellington Hill Top Resort at Yercaud hill station. Our riders from Chennai and Coimbatore had already reached there and eagerly waiting to welcome us at the resort. The tea offered at the resort tasted very nice. Post tea, I found rooms at the resort open and I crashed onto the bed for an hour’s power nap in one of the rooms until the rest of the bikers and 2 of our cars reached the resort. 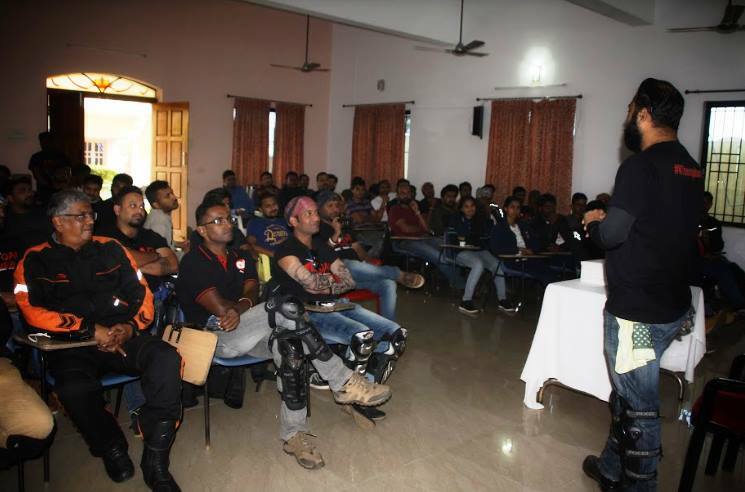 Meanwhile, I interacted with few of the riders as they reached the venue; they said that the group had some candid photography sessions on their way at the ghat section and a small breakdown with 1 of the bike’s chain link being cut. Yet again, Our Rider Usmaan bhai who is also a Mechanic by Profession came to the rescue. As the entire group reached the resort and were at their comfort post chaai and some snacks, every one of us assembled in the resort’s meeting / function hall. 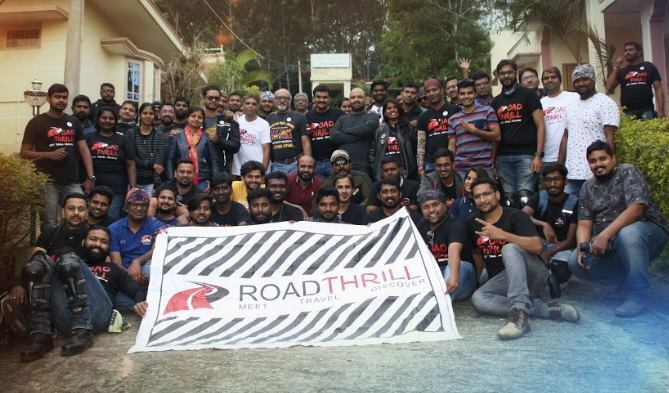 We first started with the introduction of a walk through journey of Road Thrill during 2017, and how the family has grew across different cities and chapters. The RT badges were distributed for members who have completed 5 or more rides with Road Thrill. Few surprising good news that came there; launch of the business cards for RT Admins, Launch of the RT Ambassador Programme. 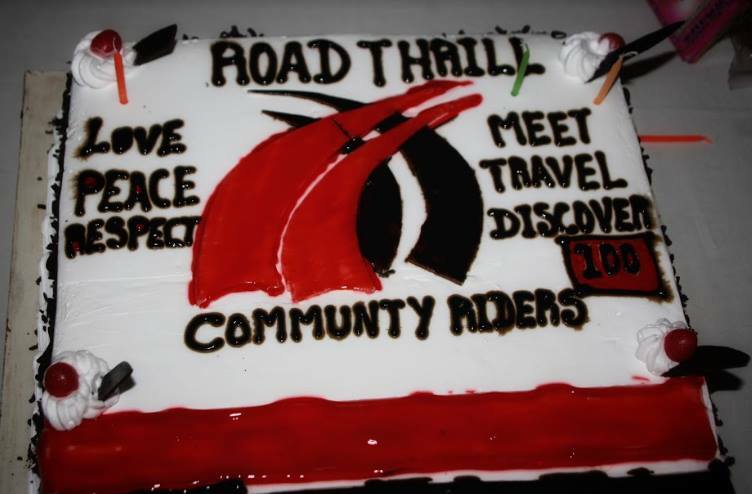 RT Coimbatore had arranged for a cake in the memory of the 100th Ride. 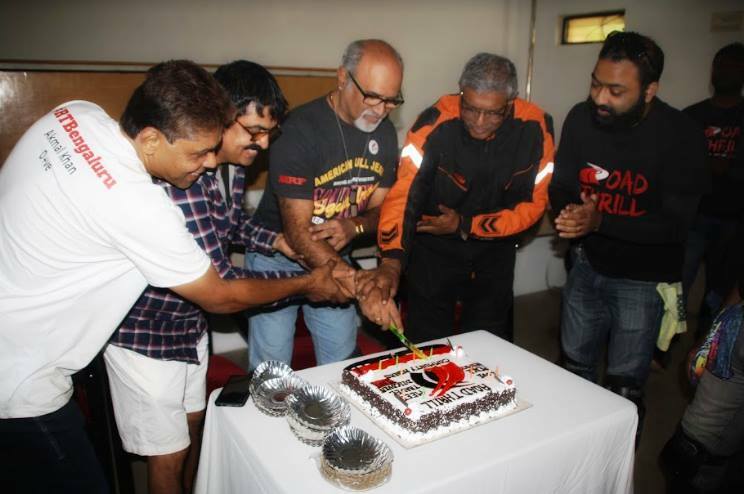 We called upon few of our esteemed senior riders Akmal Bhai, Sudheendra Sir, Udayshankar Sir and Selva Sir to cut the cake. After lunch that was served at the resort and some chit-chat with all the members from the other chapters, we started our ride back taking the 20 hairpin curves downhill from the hill station. Bidding good bye to Coimbatore and Chennai team, we headed back to Bangalore. 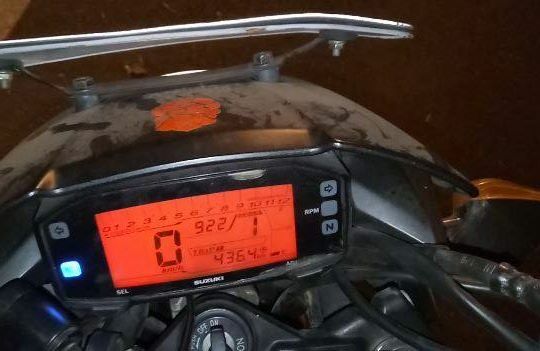 As we crossed Salem, 1 of our rider from Shimoga had some issues with the bike’s fuse and he got it replaced by himself a couple of times on the highway side. We stopped for 2nd chaai stop during the return journey at Café Coffee Day, Dharmapuri where Usmaan Bhai was waiting for us to have a look through the bike’s fuse or wirings. Abhishek Bhai, JP and a couple of us stood there until Usmaan bhai fixed the bike and the rest of us carried on the journey. As RK Bhai and I were at the tail end, we saw Gaurav Bhai stopping over with 2 more bikes where 1 of the bikes faced some starting problem. We assisted Gaurav Bhai to clear the carbon from the bike’s fuse and got the bike to start. Even though these 2 bikers were not from our group; we helped them to fix their bike. 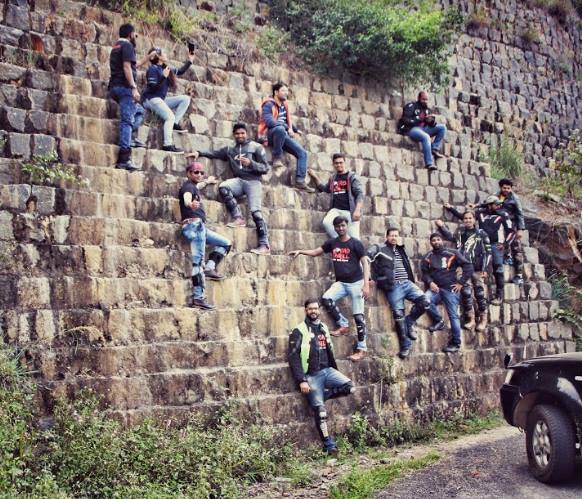 Biking is all about the bond of Brotherhood, a Biker will never leave another biker stranded in problem alone. We at Road Thrill always keep the true spirits and the bond of BikingBrotherhood, be it our own rider member or any other rider on the road. Post a 3rd chaai stop along the journey, we rode straight until a toll Naka, the one before the Electronic City. 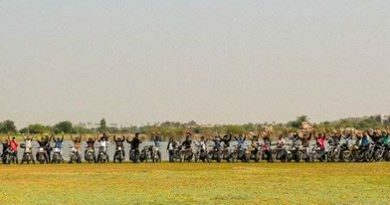 As this being the disperse point for the ride, greeting goodbye to each and every-one of us, we headed back to our respective homes. It was a good memory from the 100th ride, special thanks to Shimoga team who rode all the way from Shimoga to join this 100th ride and again ride back home to Shimoga the next day, Dr. Senthil Sir who rode from Coimbatore to Bangalore only to ride along with the Bangalore folks, Coimbatore and Chennai Teams, Road Thrill Women Riders for making this ride a cherishing and a memorable one. Thank you one and all who made for this big “Centurion Ride” and special thanks to #RTCoimbatore for the wonderful hosting. Stay safe, until next time I share my Travel Story.